Meet the Philosophers of Ancient Greece: Everything You Always Wanted to Know About Ancient Greek Philosophy but didn’t know who to ask. ‘The memory of the pleasure which this spot afforded me will not be .. easily erased. The columns… are so exquisitely fine, the marble mass so vast and noble, that it is impossible perhaps to conceive greater beauty and majesty in ruin‘. A monument of enormous proportions and grandeur, the temple of Didyma vies for the most impressive site on Turkey’s west coast. This is no gentle, graceful shrine, quietly echoing former glories, instead it shouts loud its power and prestige. Here as you walk beneath soaring columns, or down dark vaulted corridors to the innermost holy of holies, you can still feel the might and influence wielded by the old gods. As famous in its heyday as the oracle at Delphi, Apollo’s prophetess at Didyma was visited by pilgrims from across the Greek world. The oldest oracular responses date back 2,600 years. One inscription answers a question whether it was right to engage in piracy – the god’s response, ‘it is right to do as your fathers did’. The site itself is older still, and like the name, Anatolian. Even before the Greeks settled here, the location with its laurel trees and holy spring was sacred. I first visited Didyma when walking across Turkey retracing the footsteps of Alexander the Great. Setting out from ancient Miletus, I headed into the hills searching for the Sacred Way, connecting city and temple, repaved by the Emperor Trajan cAD100. It’s not for the faint hearted, but if you have time, fitness, and water, ask a villager in Akkoy if he’ll take you on the old way (eski patika) to Didyma. The statues and monuments that once lined the route are gone (some are stored in the British Museum), but you can still pick out the processional path, and the waystations where pilgrims rested. If you can’t face an endurance test, the greatest section of the Sacred Way is easier to hand, unearthed in recent times by German archaeologists immediately north of the temple. Beside antique baths and shops, lies a grand boulevard laid out in giant white slabs that dazzle in the Mediterranean light. 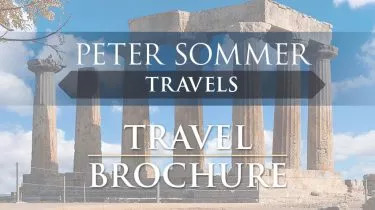 Here you can tread the very footsteps of the ancients, the pilgrims coming to seek Apollo’s guidance, or the tourists en route to the Great Didymeia festival held every four years. The modern road is lined with souvenir shops and tourist touts, but don’t turn your head in dismay. Little has changed. 2,000 years ago, travellers would have run the gauntlet of local guides, the exegetai ‘explainers’ who took them around for a fee, and the trinket sellers, with their Apollo pots, or miniature temples – silver for the wealthy, terracotta for the masses. A few centuries back, the temple was almost hidden from view, covered in a mound of detritus following an earthquake. Now the temple stands completely exposed. Great Ionic capitals with swirling volutes lie scattered about. Enormous Medusa heads that decorated an architrave atop the columns sit prone on the ground. Her prophecies were written down, there was even a place for them to be transcribed, the ‘chresmographeion’, but where this was, and where supplicants waited eagerly for answers is unclear. We do know that Apollo’s mouthpiece fell silent at times. 2,500 years ago Didyma was sacked and looted, either by the Persian king Darius following the area’s revolt in 494, or by Xerxes after the invasion of Greece in 479. The priests who administered the temple, the Branchidae (named after Branchus, a shepherd seduced by Apollo and given the power of divination) willingly handed over the treasures, including Apollo’s bronze statue. Their sacrilege was infamous in antiquity. They were resettled by the Persian king in Central Asia, and their descendants extraordinarily discovered by Alexander the Great north of Afghanistan in 329BC. For their ancestors’ act of treason he killed all the men and sold the rest into slavery. Next, walk through the porch, and single out the column bases carved in the most stunning designs, a feature almost unique in the Greek world. Down one of the dark passages, you’ll come into the temple’s heart, its cella. So large, Strabo reports that to roof it proved impossible. Instead it was left open, a court planted with laurel, Apollo’s hallowed tree, with a shrine housing the god’s image and sacred spring. After 150 years silence, the spring magically gushed again and the oracle spoke forth when Alexander the Great liberated the region from Persian control. The prophetess declared Alexander ‘born of Zeus’ and forecast his triumph over Persia. One of his successors, Seleucus, returned the stolen Apollo statue from Persia c300BC, and set to work rebuilding the temple you see today. For nearly 700 years it remained a building site, with up to 8 architects and 20 construction companies working simultaneously. But this vast wonder was never finished. Alongside knife-edge masonry remain protruding nodules inscribed with Greek letters, referring to the workmen who worked on a block, but never dressed it smooth. Even unfinished, it was considered in antiquity one of the greatest of all Greek temples. It is without doubt one of the biggest. Apollo’s oracle was silenced forever, and a Christian church erected in the temple’s cella. Why not go and see Didyma for yourself. One of our expert guides will personally show you around the ancient temple on one of our escorted tours that explore this region in south-west Turkey. Return to main Travel writing page. Our memories of the southern Turkey gulet voyage with you are among the happiest we have. Tom and I thoroughly enjoyed this escorted tour in Turkey - even better than we had anticipated. Your enthusiasm and knowledge really brought Alexander and the other periods to life for us. We loved all the archaeological sites we visited, and to see some of them late in the day, and have them to ourselves was a real treat. Well done. We thank you for one of our very best trips.